A corpus of Rs 210 crore has been allocated for infrastructure projects including the bio mining project at Pirana dumping site. Of this, Rs 65 crore and Rs 25 crore have been approved for a split flyover at Pallav Char Rasta and Gandhigram railway station underpass, respectively. The Central Government approved a 45-km long Sarkhej-Gandhinagar six-lane road project worth Rs 846 crore. Expected to be operational in the next two years, the road will be toll free and ease traffic heading towards Saurashtra and Gandhinagar. Flyovers are planned at seven crossings - Sanand, Ujala Circle, Pakwan, Vaishnodevi, Uvarsad, Sargansan and Infocity. After an expenditure of Rs 3,000 crore, the State government sanctioned an additional Rs 592 crore for Ahmedabad metro project in FY 2018-19. First stretch between Vastral and Apparel Park is likely to be completed by the end of 2018. Ahmedabad Municipal Corporation (AMC) proposed construction of three-layered bridges at Paldi and Nehrunagar Circle, an elevated express corridor from Jamalpur to Kalupur railway station and widening of the underpasses at Madalpur and Mithakali. All the projects are expected to help decongest traffic across the city. Out of the 2,100 projects approved by Gujarat Real Estate (Regulation and Development) Act (RERA), around 1,000 are located in Ahmedabad alone. Close to 200 agents/brokers, too, have been registered under the State RERA. 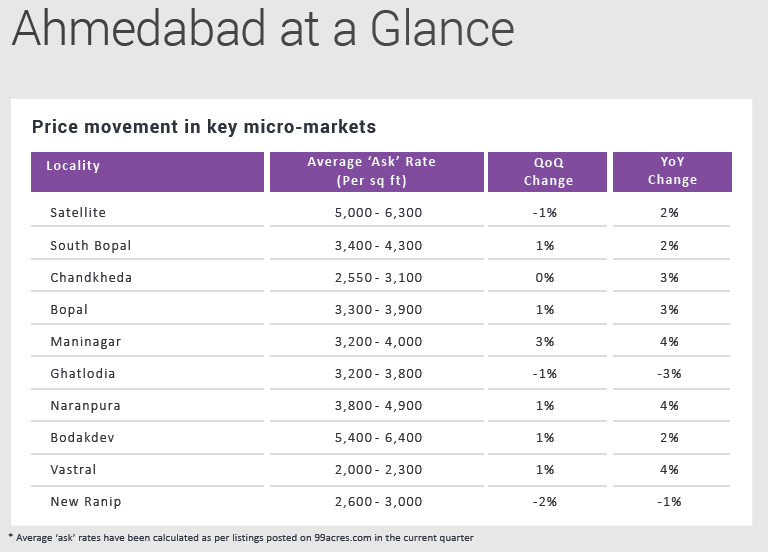 Ahmedabad witnessed a stagnant real estate market in the first quarter of 2018. Developers stayed cautious of launching new projects due to an unsolicited inventory overhang and tedious RERA compliance. A slew of infrastructure announcements, however, could improve market sentiment. The metro rail project, better road networks and the Government’s most ambitious bullet train project are speculated to overhaul the city’s livability index, subsequently benefitting real estate. Of all the aforementioned positives, the city’s metro line holds the key to its realty fortunes the most. Average weighted capital ‘asks’, which have been stagnant for several quarters in the past are also expected to go north once the phase 1 of the metro becomes operational in 2019. While the rental market narrates a better picture with a three percent growth in Jan-Mar 2018 against the same quarter in 2017; the uptrend is primarily a result of renewal in lease agreements. Residential pockets such as Motera, Sabarmati, Vijay Nagar, Stadium and Vastral are speculated to gain maximum traction in the ensuing quarters as metro completion gains steam. Additionally, the city is looking forward to an infrastructural facelift with the State government’s approval to the 45-km Sarkhej-Gandhinagar six lane road. This will smoothen traffic heading to Saurashtra, North Gujarat and Gandhinagar. Allocation of Rs 12 crore to widen bridges and for the construction of a new flyover connecting Naroda and Patia would also help improve the connectivity quotient of the area. To summarize, Ahmedabad’s capital and rental residential market is dependent on its impending infrastructure overhauls along with new supply in the affordable segment. Residential sales in Ahmedabad remained meek in the first quarter of 2018. RERA implementation is expected to reinstate buyers’ confidence in the ensuing quarters, which will act like a demand appetizer. The city awaits new launches in the budget housing category to lift sales volume. Capital prices, however, may continue maintaining status quo over the next few quarters due to the prevalent competition in the secondary market and the price-competitive fresh inventory. Ahmedabad projected minimal salesand new residential launches in Jan-Mar 2018. Braving the tide, Maninagar topped the capital charts with a three percent increment, QoQ. Sound transportation network coupled with premium social infrastructure maintained buyer interest in the locale. Motera, too, witnessed a hike of three percent in the capital ‘asks’, QoQ. The locality is well-connected to the Visat-Gandhinagar Highway. A proposed metro rail station in Motera in the Ahmedabad-Gandhinagar corridor would further boost demand and hence, capital and rental price points in the future. Bopal and South Bopal offer a plethora of competitively priced housing options ranging from apartments to villas with good connectivity and developed amenities. As a result, both the areas posted upward price movement in the current quarter, albeit minimal. The rental market narrated a merrier picture with a three percent growth in Jan-Mar 2018, against the same quarter in 2017; primarily due to renewing lease agreements. Localities such as Motera, Sabarmati, Vijay Nagar, Stadium and Vastral are expected to to gain maximum rental traction with the metro nearing completion in the ensuing quarters. While popular residential pockets of Gota and Vaishnodevi Circle saw rental increments to the tune of 10 percent, each, YoY, Chandkheda – an emerging rental hotspot – came into the limelight with a rise of seven percent in rental ‘asks’. Proximity to the ONGC office and newly developed 100 ft wide New CG road (Chandkheda-Gandhinagar) have been the predominant growth drivers for the pocket. Rents in localities such as Makarba, Satellite, and Prahlad Nagar, too, registered a jump of eight, seven and six percent, respectively, over the last one year. Variety of rental inventory suiting different pockets and proximity to office spaces, prominent eateries, and major retail brands lured the tenant community to these locales. Emulating other metro cities, Ahmedabad, too, witnessed a demand-supply mismatch across price brackets. The imbalance was all the more predominant in the affordable segment with demand overweighing supply by a huge margin. Further, demand remained skewed towards ready inventory due to an effective 12 percent GST on under-construction properties. Not surprisingly, over 90 percent of the homebuyers across the city opted for ready-to-occupy homes. With maximum demand for properties priced within Rs 25 lakh, and very few launches in the segment, the category remained inflicted with a seven percent shortfall, in line with the previous quarter. Homes priced between Rs 40-60 lakh witnessed demand-supply equilibrium, where availability sufficed the housing requirement. Similar trends were accounted in the last quarter, too. 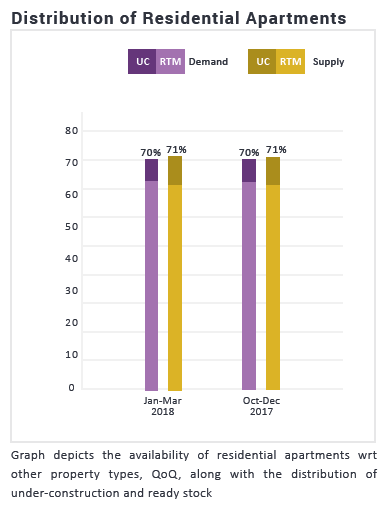 The highest demand-supply gap was seen in high-income budget category (Rs 60 lakhs and Rs 1 crore) with supply surpassing demand by 12 percent. Ultra-luxury housing segment, which has been losing its sheen due to restricted target audience, reported a demand-supply mismatch of three percent in Jan-Mar 2018. Not surprisingly, the city also reports highest unsold inventory in this category. All price categories exhibited similar demand-supply disparity, YoY, barring the mid-income housing segment (Rs 40-60 lakh), which maintained an equilibrium.